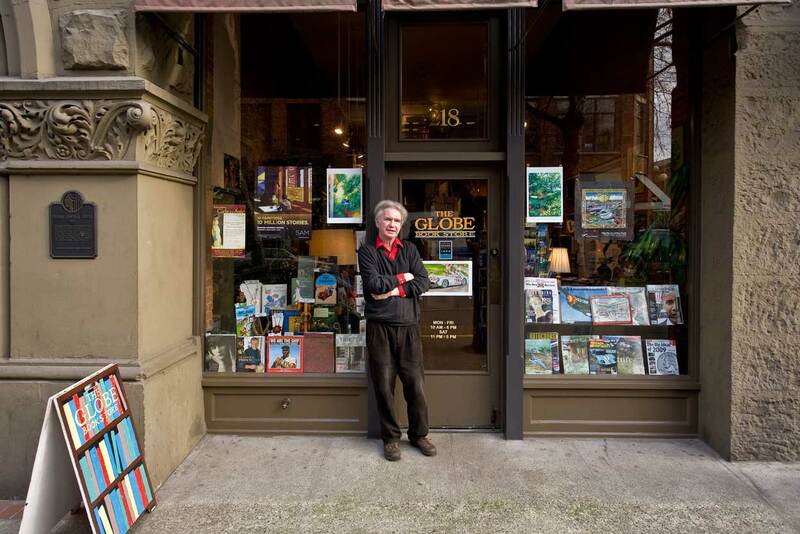 John Siscoe – with wife Carolyn – has owned and operated the Globe in Seattle for 30 years. One of our region’s finest small bookstores, it specializes in history and literature. A hundred feet north of Elliott Bay Books in Pioneer Square, this little gem and its astonishingly knowledgeable proprietor merit a visit. In the interests of full disclosure, John and I founded the Globe Radio Repertory in the mid-80s and spent nearly 10 years making radio drama for NPR (see the Jean’s Radio Theatre link in our blogroll). When you drop by, ask John about his doing the first unauthorized English translation of a late Samuel Beckett novel – and Beckett’s stunning response. Have to look up and read that Beckett novel – and I didn’t know you were in radio broadcasting! You and Carolyn are real gems! Thanks for all you do. Thanks so much for this charming photo of John. And thanks so much for putting up the GRR tapes. I have searched for these for years on the web since listening to all of the originals “live” on NPR. I was even looking forward to Kafka. Malheureusement, it seems NPR was not. Their loss.